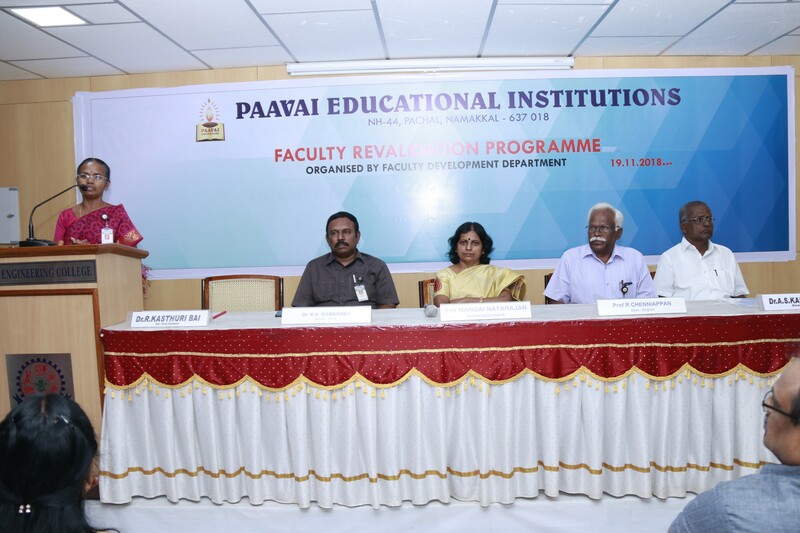 The inauguration of Faculty Revalidation Programme(FRP) for the academic year 2018-19 for the faculty members of Paavai Engineering College, Paavai College of Engineering and Paavai College of Technology was held in the Smart Hall at 02.00 p.m. on 19.11.2018. The programme started with the prayer song followed by an epigraph, ‘Ask yourself, if what you are doing today, is getting closer to where you want to be tomorrow’ emphasizing the significance of the introduction of Faculty Revalidation Programme. 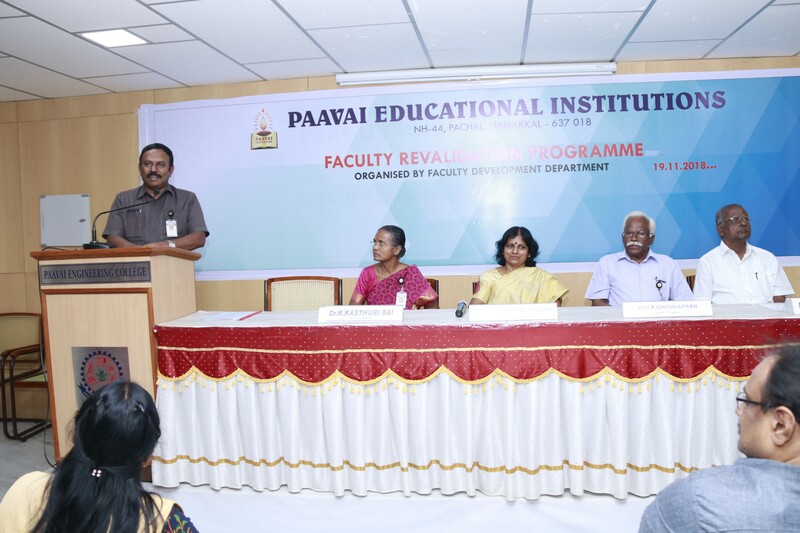 Smt.Mangai Natarajan, Correspondent, Paavai Institutions, inaugurated the event and delivered the inaugural address. In her inaugural address, she highlighted Paavai philosophy and principles with the slogan, ‘Healthy Paavai, Wealthy Paavai and Powerful Paavai’. She made all the faculty members recite the slogan. She said that FRP is not a delivery forum but a discussion forum and the presenters should have the thirst to learn and update their knowledge and skill from the seniors and experts on the panel. After which, Dr.K.KRamasamy, Director Administration, felicitated the gathering. In his felicitation, he pointed out that the current FRP is the 17th FRP which has been in vogue right from the inception of the institution in the year 2001. 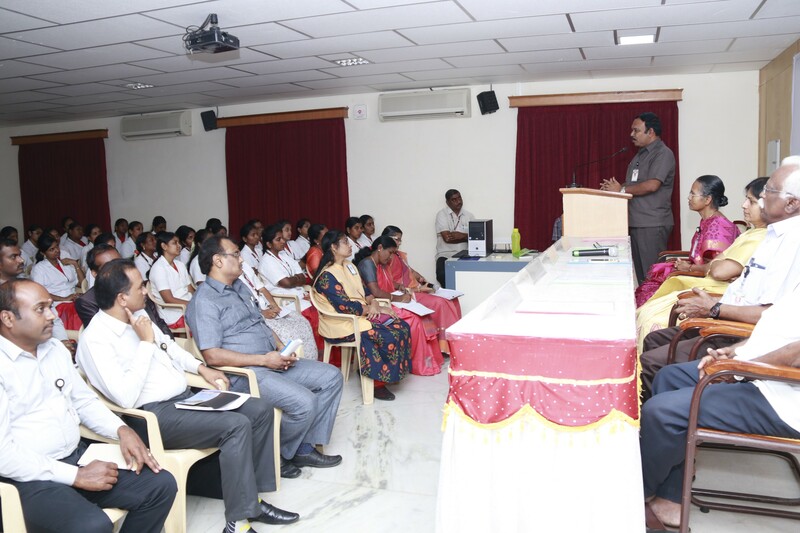 He stressed the objectives, importance and ideology of Faculty Revalidation Programme. Further, he said that the Faculty Revalidation Programme provides a platform to acquire, share, exchange and update one’s knowledge . At last, he concluded by saying that Faculty Revalidation Programme is not a fault finding process but it is a fact finding process and the members should use this feedback channel in the right sense of the word. With this the inauguration came to an end. 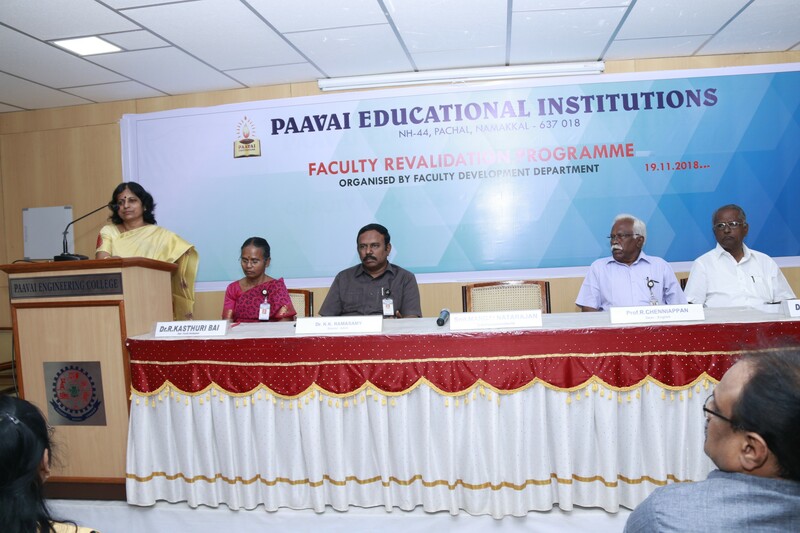 Dr.R.Kasthuri Bai, Dean Faculty Development Department, welcomed the gathering. 125 faculty members participated in the inauguration. The Deans, Principals, HoDs and senior faculty members graced the occasion.